Mansfield Town midfielder Jack Thomas has joined Vanarama National League North outfit Tamworth on loan for a month. The 21-year-old has found first-team opportunities limited this season at the One Call Stadium because of tough competition for places within the Stags’ camp. Thomas, who hails from Mansfield Woodhouse, enjoyed a previous loan spell at another National League North club, Boston United, earlier in the season. Tamworth lie in 15th position in the table and face Blyth Spartans at The Lamb tonight. 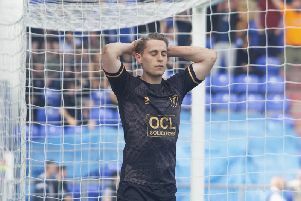 Thomas was regarded as an exciting prospect when he made his professional debut as a substitute in Stags’ 3-0 home victory over Rochdale in April 2014. Operating in centre-midfield, his dynamic, tough-tackling, no-nonsense attitude won him many plaudits. A graduate of Mansfield’s academy set-up, Thomas captained the club’s youth team in 2013/14 when he regularly impressed and helped them to a second-placed finish in the Football Conference Youth Alliance CYA (Midland Division). Thomas enjoyed a spell on loan at Hednesford Town before returning to Mansfield in February 2015. He had a successful 2015/16 season, but then struggled with a groin injury at the beginning of last term. After boss Steve Evans arrived at the One Call Stadium, Thomas joined Barrow on loan in February 2017 to further his development. Meanwhile, 18-year-old Stags striker Zayn Hakeem has extended his loan spell by a further month at Grantham Town of the Evo-Stik Northern Premier League’s Premier Division.